Results: New insights into the reactive phases and processes occurring within radioactively contaminated subsurface sediments will pay off for current and future studies of contaminant behavior at U.S. Department of Energy sites. The results from a recent study published in Geochimica et Cosmochimica Acta by scientists at Pacific Northwest National Laboratory will help resolve questions about the movement of subsurface contaminants and develop effective site remediation strategies. Previous studies at PNNL have demonstrated that the contaminant technetium-99 (see sidebar) can be reduced from its most mobile state, pertechnetate, or Tc(VII), to tetravalent technetium, or Tc(IV), which can form a solid and remain associated with the sediment. This reaction occurs when pertechnetate is reduced either directly by microorganisms or by certain forms of iron that exist naturally in the sediment. The scientists have also shown that iron from biological reduction processes can be a very efficient reductant of pertechnetate. But this depends on the form of iron in the subsurface, and the form dictates the reaction rates and end products. What remains uncertain is the fate of technetium in reduced sediments when subject to fluctuating reduction—oxidation (redox) conditions. Also uncertain is if and when aerobic groundwater infiltrates into reduced sediments, causing re-equilibration-which can happen with natural groundwater movement in the subsurface. To better understand these uncertainties, the researchers investigated the fate of technetium following the reduction process and exposure of reduced sediment slurries to air. They studied two sediments with differing mineralogy and aggregation state: one from the upper Ringold Formation at the Hanford Site in south-central Washington state, and one from the Field Research Center (FRC) site on the Oak Ridge Site in east Tennessee. 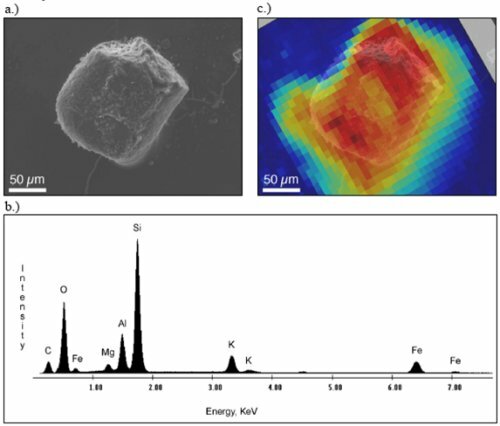 Characterization of technetium-containing particle isolated from oxidized FRC sediment: a) backscattered electron micrograph, b) electron microprobe energy dispersive X-ray analysis and c) BSE image with X-ray microprobe, Tc-concentration overlay. "Previously, we investigated issues pertaining to microbial and geochemical reduction reactions," said lead author and PNNL Laboratory Fellow Jim Fredrickson. "But the long-term question is, if pertechnetate becomes reduced to less-soluble Tc(IV), what happens if the situation is reversed, and the sediments are subsequently exposed to oxygen? That is, if sediments are contacted with aerobic groundwater, will the Tc(IV) be mobilized? So in this study, we examined the re-release of technetium in sediments exposed to air." Why does it matter? At DOE's Hanford Site, technetium from leaking nuclear waste storage tanks has migrated to significant depths in the vadose zone, which, in the central plateau area of Hanford, is close to 60 meters. Currently, there is little to prevent this mobile technetium from eventually entering Hanford's unconfined aquifer and traveling with groundwater to the Columbia River. Contamination of the river by technetium is a serious concern, as the river water is used for drinking and agriculture. Understanding how iron—specifically Fe(II)—in the sediments reacts with technetium to reduce it, or change it to a less mobile form, can contribute to understanding whether technetium will indeed reach the Columbia River and could contribute to the development of remediation strategies for safely containing technetium in the subsurface. Methods: The scientists investigated the oxidation rates of tetravalent technetium as well as the form and distribution of residual iron after an extended period of exposure of sediment slurries to air. Tetravalent technetium is relatively insoluble and remains associated with sediments, but converts to pertechnetate when it's oxidized. "The process is similar to rusting," said Fredrickson. "Metallic iron can react with oxygen over time, and iron is oxidized to Fe(III)—forming rust (iron oxide) in the process." In the Ringold Formation sediments, tetravalent technetium oxidized rapidly and completely when contacted with air and was released to solution. In contrast, in the FRC sediments, oxidation was slow and incomplete despite similar molecular-scale speciation of technetium as found in the Ringold sediments. Why? The researchers found that the technetium's reactivity depends on the nature of the material in the sediment. After the scientists reduced the technetium in the sediments and exposed them to air for nearly a year, they sent the sediments for synchrotron X-ray measurements at the Advanced Photon Source at Argonne National Laboratory. These molecular-level measurements of the FRC material revealed a unique, oxidation-resistant Tc(IV)-Fe(III) molecular species. "Both sediments contained iron and manganese as redox-active phases," noted Fredrickson, "but the FRC sediment also contained a high proportion of a certain class of minerals called Fe-phyllosilicates, or micas, of different types." They found that the oxidation-resistant molecular species was associated with these iron-containing mica particles. The researchers transferred several of the particles to the Environmental Molecular Sciences Laboratory at PNNL for single-particle, micro-X-ray diffraction analyses, a new capability for determining the structure of individual mineral particles. From these analyses, the researchers identified the mica as celadonite, a common weathering product of basalt—a common rock type in the Columbia Basin. "If celadonite or related iron-containing micas are found in the subsurface at Hanford, they could impact the migration of technetium in the groundwater before it reaches the Columbia River," speculated Fredrickson. In summary, the findings indicate that certain forms and/or locations of pertechnetate generated through reduction by sediment-associated iron, especially iron in association with phyllosilicates, may be exceedingly resistant to remobilization by oxidation. This may significantly impact the long-term fate and transport of technetium in the subsurface at sites such as Hanford, but more research is needed to better understand these processes. What's next? Why is this material resistant to oxidation? Is it because of the chemistry of iron in the mica particles, or the physical structure, or both? Whatever the answer, it has significant implications for long-term migration of technetium at the Hanford Site, particularly from the plume beneath the 200 Area waste tank farms. The researchers are currently investigating the reactivity of technetium with various sediments from the Hanford subsurface. This includes materials obtained during the installation of wells at the Hanford Integrated Field Research Challenge site in the 300 Area north of Richland, Washington. Acknowledgments: The scientific team includes Jim Fredrickson, John Zachara, Andy Plymale, James McKinley, David Kennedy, Chongxuan Liu, Tom Resch, and Ravi Kukkadapu, PNNL; and Steve Heald, Argonne National Laboratory. This research was supported by the Environmental Remediation Science Program, Office of Biological and Environmental Research (BER), DOE. 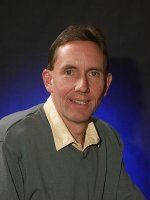 Mössbauer analyses and micro X-ray diffraction were performed using EMSL, a national scientific user facility sponsored by DOE-BER and located at PNNL. Technetium-99 (99Tc) is a long-lived (213,000-year half-life) fission product found at nuclear fuel reprocessing and geologic nuclear waste disposal sites. It's of particular concern because it is highly mobile in its most oxidized state, pertechnetate [Tc(VII)O4-]. In that form, it can migrate rapidly with groundwater discharge to, for example, the Columbia River bounding the Hanford Site. 99Tc is less mobile in its reduced form, tetravalent Tc, or Tc(IV); therefore, scientists are looking for ways to reduce pertechnetate, or Tc(VII), to Tc(IV) by studying how it behaves as it interacts with the soil components. Researchers are also investigating how certain anaerobic bacteria can reduce 99Tc, either directly via enzymatic activity or indirectly via electron transfer to iron-bearing minerals that in turn react with the 99Tc.